Last weekend Antony and I visited his grandmother for lunch. As we were leaving, she picked some pears from her tree for us to take home. They are Asian pears so I knew I wanted to keep the flavors of this dessert subtle and not overly sweet. Mix 3 cups of water and 5 packets or around 60g of green tea powder until it is dissolved. Add sugar, ginger, orange, and vanilla to the mixture and bring to a simmer for 5 minutes. Peel and core the pear, leaving the stem. Put the pear in the simmering liquid and cook the pear for 30 minutes or until tender. Remove the pear, discard the solids, and continue to cook the liquid for about 45 minutes until it is reduced to a thicker consistency. Meanwhile add the last packet or 20g of green tea powder to whipping cream. Whisk cream until fluffy. Place the pear on a plate and drizzle the reduced sauce on top. Add a dollop of green tea whipped cream and salted pistachio brittle on the side. This is the fanciest dessert I have ever made. The flavors are very complex because if I didn't make it myself I probably wouldn't be able to guess all the ingredients. The ginger and orange give the pear a zing which is then tamed by the green tea whipped cream. The brittle adds a crunchy contrast and sweetness to it. Pears are one of my favorite fruits, and incorporating them into desserts is a delicious way to up your daily serving of fruit. 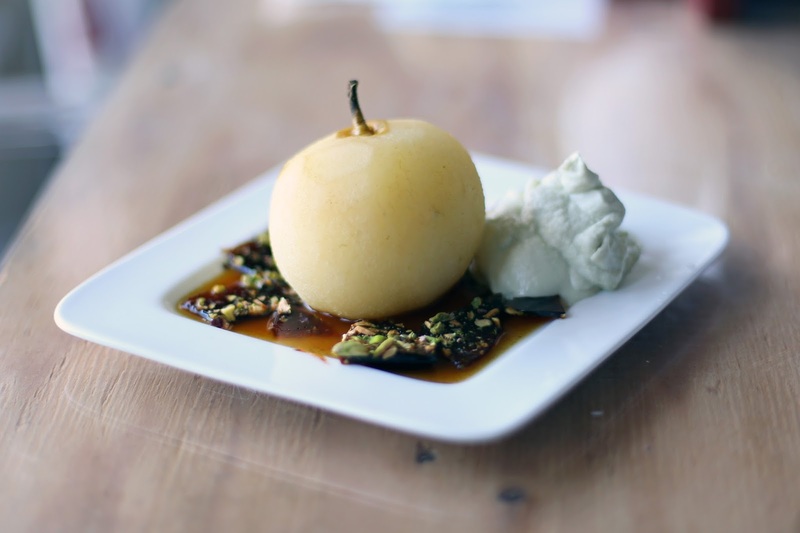 This baked pear recipe is easy and quick, with very little prep and cleanup. First, prepare the pear by washing and cutting it in half. Cut the core out, and peel it if you want. I left the pear on for one half but not the other. Sprinkle the pear halves with brown sugar and lemon juice. To prepare the marscapone topping, mix white sugar with marscapone at a ratio of 1:2. Bake the pears in the oven at 375 degrees for 20 minutes. Let the pear cool for a few minutes, then choose the topping. 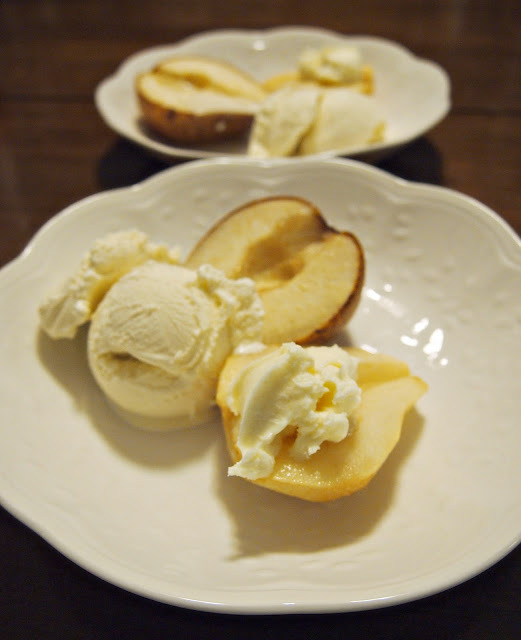 Serve the pear with either ice cream or a dollop of marscapone. Your mouth will appreciate how the topping is cold but the pear is warm, and the way your spoon glides through the pear is satisfyingly. I prefer the marscapone topping because the flavor contrasts more with the pear than the ice cream does... but both options are worth trying out for yourself!